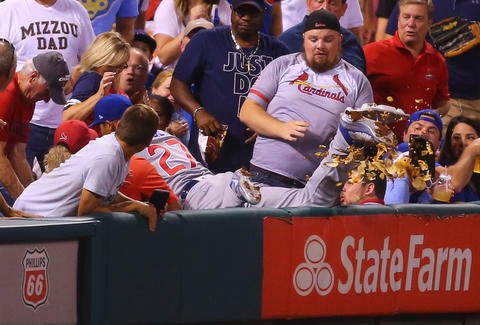 In the world of contact sports, nachos are often among the first casualties when things go awry, and this unfortunate truth was on display Monday night when the Chicago Cubs played the St. Louis Cardinals. Spoiler alert: perfectly good nachos were destroyed in the name of sports. Andrew Gudermuth, the St. Louis man who lost his tray of nachos in the incident, was understandably sullen after the collision. A reporter from Fox Sports was there to capture his anguish as he told the tale of losing his Busch Stadium nachos. The episode wasn't all for nought, though. Because Russell is a standup guy whose team was winning 8-1, he brought Gudermuth a fresh batch of nachos, served with a side of remorse. But as this was a sporting event between two divisional rivals who take nachos seriously, Gudermuth threw a subtle jab in the Cubs' direction on Twitter. Apparently, Russell only gave him plain nachos, while the nachos he picked up earlier were "loaded" with multiple fixings -- a discrepancy that Gudermuth took issue with. Still he called the whole thing "unforgettable" and apparently dubbed himself "Nacho Man" in the process. Wether Gudermuth is awarded a lifetime supply of nachos at his local ballpark or becomes a semi-official mascot for Velveeta, remains to be seen.